With just two or three hours, you can experience the powerful thrill of an all-terrain vehicle when you try one of the Phoenix ATV tours. Guided tours or adventures where you’re on your own are available through this Arizona outdoor fun. Be careful. If you’ve never fired up the throttle of an ATV before, you might get so hooked that you’ll want to buy an ATV for your garage back home. An all-terrain vehicle, or ATV, is like a four-wheel version of a motorcycle. Similarities include handle bars that the driver uses to steer the vehicle and a seat in the middle that the driver straddles and sits upon while driving the rig. Like a motorcycle, the engine’s throttle and brakes are located on the handle bars. But, unlike a two-wheeled motorcycle, an ATV has four wheels (early ATVs had three) and some possess six wheels. Most all ATVs are permanent four-wheel drive vehicles. The tire pressure in all ATV wheels is low, giving them a fantastic ability to maneuver over rugged terrain and over soft, sandy ground—just the kind of land that you find in a desert. Most of today’s ATVs contain automatic transmissions and that’s the only type of vehicle that you’ll find on Phoenix ATV tours. So, driving them is easy. You just sit on an ATV, start the engine, squeeze the throttle and turn the handle bars left or right to steer it. If you’re familiar with brakes on a bicycle, you’re also an ace at using the brakes of an ATV. The Guided Desert ATV Tour gives you two hours of sightseeing onboard an ATV powering over up to 30 miles of trails through the Sonoran Desert found in the Tonto National Forest, outside of Phoenix. You’ll be whisking over dry riverbeds and some water-filled brooks in an adventure of a lifetime. Enjoy the desert scenery that includes volumes of ocotillo plants and saguaro cacti, along with desert reptiles, such as snakes and lizards, while on this selection of Phoenix ATV tours. You enjoy snacks and water during the tour. Plus, there’s a hotel pickup for this Phoenix ATV adventure. For three hours, one of the Phoenix ATV tours presents you with a guided ride into the Bradshaw Mountains that includes safety equipment, fuel, water and an educational briefing. The winding curves of the trail through the Agua Fria River Valley, which includes several side paths, makes you glad that a guide is along to show you the correct route. Your ATV forges some wet crossings while you pass gorgeous rock formations of the desert Southwest U.S. You’ll see barrel and saguaro cacti along the way. There’s a stop at the 1875 ghost town of Tip Top, handing you one of the best scenic views out across the desert floor. Gold mining history is presented by your tour guide. Perhaps you’re an old hand on an ATV or a utility task vehicle (UTV). If that’s the case, one of the ATV rentals in the Tonto National Forest might be your best selection from the Phoenix ATV tours. 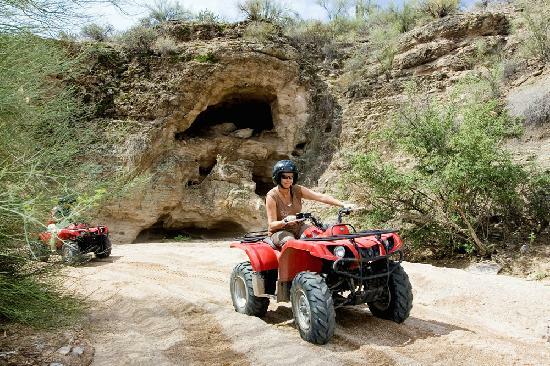 Through these ATV rentals, you’re on your own discovering the 30 square miles of the Tonto National Forest. Don’t worry. The Phoenix Trailhead Number 2123 is clearly marked with a self-guided tour that’s both fun and interesting. With picturesque panoramas, unique rock forms and beautiful desert flowers, this involves Arizona outdoor fun at its finest. You’ll drive your rental on a trail which is clearly marked and follows the tranquil Verde River. Desert wildlife is plentiful. On any of these Phoenix ATV tours, you might see the fast moving whiptail, a lizard that’s from 6½ to 9 inches long. There are Sonoran Desert toads, one of the largest toads native to North America at up to 7 inches long. Desert snakes also inhabit the Tonto National Forest, from the non-venomous Sonoran Mountain Kingsnake to the venomous Western Diamondback or Arizona Black Rattlesnake. Of course, the familiar image in the 1950s-vintage cowboy movies of the cow herd driven near giant cactus colonies involves the same giant saguaro cacti that you see throughout these Phoenix ATV tours. Costs not included in all Phoenix ATV tours involve a security deposit and optional insurance. ATV drivers must be 18 years old and possess a valid driver’s license. Of course, those under 18 years old are welcome to ride on the ATVs. You can drive by a desert on the interstate highway or fly over it in an airplane, but until you put yourself face-to-face with a desert environment, you just don’t know it. Give yourself an exciting desert education with these Phoenix ATV tours.